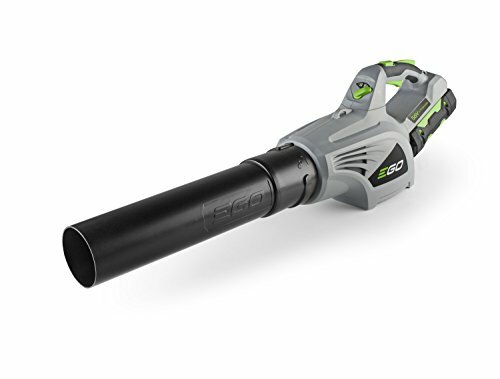 If you want a leaf blower, don’t want the noise, fumes & expense of a gasoline blower, and the area you need to clear is not within reach of the power outlet that a corded electric leaf blower would need, perhaps you should consider a cordless leaf blower. If you have a GFCI power outlet close to your work area, and you would like the twin advantages of lighter weight & no battery life issues, have a look at our corded electric leaf blower review instead. If you need the ultimate performance only a gas blower can provide, check out our review of the best gas leaf blowers. What Makes A Good Cordless Leaf Blower? Although battery-powered leaf blowers are quieter than their gasoline counterparts, the internal fan blowing air at up to 150mph through a small nozzle is still noisy. You should still consider noise regulations in your area & confirm the model you choose conforms to your local regulations. We will only look at Lithium-Ion cordless leaf blowers here - although it's still possible to find blowers using older battery technologies, currently Lithium-Ion gives you the best combination of high power and light weight, which is important for any portable hand-held device. Our pick for the best cordless leaf blower is the EGO LB4800 56V Cordless Blower. Though it is generally one of the more expensive cordless leaf blowers, we believe the combination of high power and low weight make this model unbeatable. In our opinion, the EGO just shades the similar offering from WORX and due to its more advanced battery technology. The final choice may come down to whether you already own other cordless tools from the same manufacturer, as both EGO and WORX provide batteries that can be swapped between different tools of the same voltage from the same manufacturer. If you’re looking for a budget option, we think the BLACK+DECKER LSW221 is hard to beat for value. 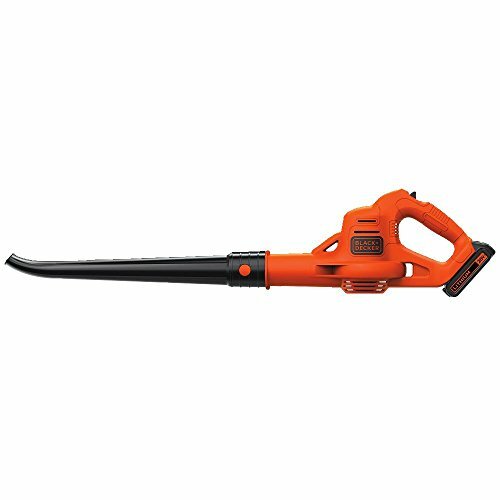 While most cordless models only have a blower function (missing out on the vacuum / mulching facility commonly found in corded blowers), one blower in this article (the BLACK+DECKER LSWV36) comes with a bag attachment, and can be used as a vacuum as well as a leaf blower. This model also has a mulching facility, which chops debris down to a smaller size for easier disposal (or potentially for use as garden mulch). Unless you are a commercial landscaper, the EGO LB4800 Cordless Blower is probably as effective as any gasoline blower you have used. The customers interviewed in the video below are more than happy with it’s performance. While the freedom from the fumes, weight and maintenance of a gasoline blower with similar performance is a blessing, one disadvantage of cordless blowers is battery run-time. Considering it's power, EGO makes impressive claims for run-time of this model - the headline figure is up to 60 minutes on low speed, with the supplied 2.0Ah battery. Realistically, you're more likely to get between 15-30 minutes. Battery life is the main reason we picked this blower ahead of the WORX model, which doesn't run for as long between charges. If you have other EGO power tools with higher capacity batteries, you can use those batteries in this blower too, for a longer run time. EGO cordless power tools quite simply have the most advanced battery technology of any brand we've seen, and in our opinion the batteries are likely to last for many more charge / discharge cycles than most competitors. The LB4800 has variable speed controls, and a "Turbo Boost" function, for a quick burst of maximum power. This leaf blower comes with a class-leading 5-year warranty from the manufacturer, and a 3-year warranty on the battery and charger. Battery life is one of the biggest issues affecting leaf blowers. The EGO model isn't as badly affected as other makes: the supplied rapid charger takes 30 minutes to recharge the battery (faster than the rivals in this article). If you had a second battery, you'd never need to stop using the blower for longer than it takes to swap the discharged battery for a freshly-charged one. Your own endurance would become the limiting factor, not the leaf blower's staying power! While the 480CFM air volume of the LB4800 is competitive, the 92MPH velocity is a bit lower than some rivals. It seems that, in an effort to keep the noise levels down (and the EGO blower is very quiet), the manufacturer hasn't supplied a detachable small nozzle, unlike some other brands. The small nozzles found on other blowers do increase air speed, but they also increase noise and decrease the total amount of air moved. The EGO LB4800 has better battery life between charges than the WORX WG591, and the batteries are likely to last longer before needing replaced. The EGO blower is slightly quieter than the WORX. The WORX WG591 air speed is significantly faster, though the EGO moves slightly more air overall. 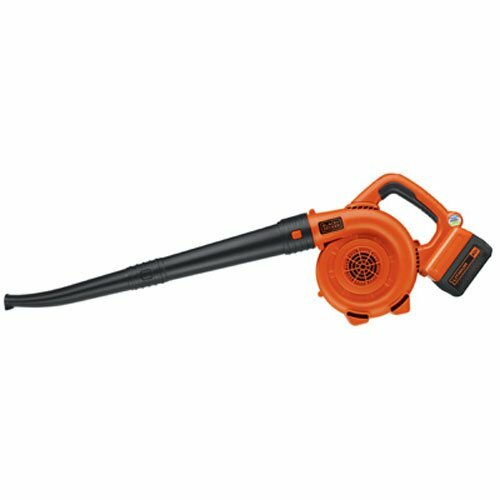 WORX promotes the WG591 Cordless Leaf Blower as an alternative to gasoline leaf blowers. If you look at the video below you'll see some real-world examples of this performance. No pull cord, no mixing gasoline and oil, no spark plugs or filters to change - just charge the battery when you're finished, and it will be ready to go at the press of a button next time. The variable speed is a great option - perfect for areas with small plants or other delicate items. WORX has put some thought into the ergonomics of this model too - the variable speed control is easy to operate with one hand. The blower itself feels well balanced and relatively light (though not as light as a corded electric model, which doesn't have the weight of a battery). WORX was established in 2004. They are one of the largest manufacturers of lawn and garden tools, as well as producing a range of power tools. The holding company (Positec) previously manufactured power tools for makers such as Black & Decker. This leaf blower comes with a 3-year warranty from the manufacturer. The most common complaint with this leaf blower is the battery life. Typically the battery will only last for around 15 minutes if you make use of the performance. Charging time is 90 minutes, so you'd probably want a second battery if you have larger jobs. 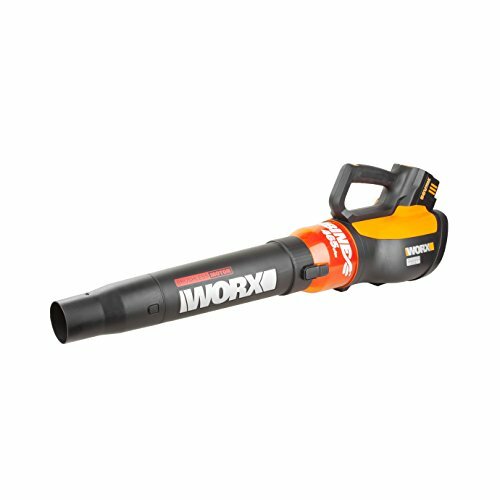 Batteries from other WORX 56V tools are compatible with this blower, so if you already own another WORX 56V tool, the battery life may not be a problem. There have been isolated reports of batteries not charging completely from new - however WORX customer service seems to be quite responsive, if you are unfortunate enough to have this problem. The battery and charger have a 1-year warranty (separate from the 3-year warranty on the machine). Until 2016, the Toro PowerPlex 51690 was probably the best cordless leaf blower you could buy. Its air speed and air volume are still competitive, however the older 40V battery technology has fallen behind its main rivals. EGO, WORX and Black & Decker all offer 56V or 60V blowers (in reality the 56V and 60V batteries are the same voltage). All else being equal, a 40V battery can’t supply as much power for as long as a 56V battery. There are some attachments available for the Toro (e.g. for gutter cleaning) which are not available for all its rivals. If you decide against our #1 and #2 choices, and you can find the Toro for a reasonable price, or if you are already locked in to Toro’s 40V cordless power tools, this is probably your best choice. If you’re after a cheap and cheerful cordless leaf blower / sweeper, that is still powerful enough to get the job done, the BLACK+DECKER LSW221 may be ideal for you. While it’s not as powerful as some other blowers, and misses out on features like variable speed control, if you have a small area that needs a light clean, this sweeper could fit the bill. At 4.4lb, the LSW221 is even lighter than our no. 2 choice. While the performance is nothing to get excited about, and the 2-year warranty is less than other manufacturers, this blower is usually around ¼ to ½ the price of some of the other blowers in this article. Prices do change frequently, so click below to find the latest price. The Black & Decker LSW36 is a lower-priced 40V unit. The air speed, weight, noise and warranty are all competitive, however this model just doesn’t move the same volume of air as its competitors – in fact, at 90CFM, it actually moves less air than its 20V stablemate (our budget pick). It does have some slightly different attachments compared to the other blowers here, such as a combined blow tube / scraper, which lets you scrape up matted leaves and debris - in our opinion, all leaf blowers should have this. Unlike the other blowers here, this blower is also available with a vacuum / mulching function (under a slightly different model number LSWV36). 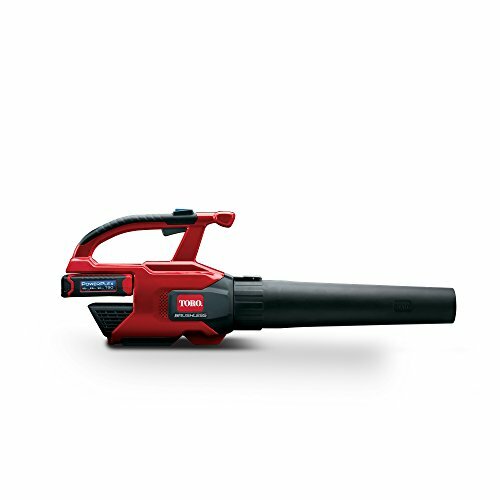 However, we feel the performance is inadequate for us to recommend this model: if you absolutely must have a cordless blower / vac, then this might be an option for you. Black & Decker back the LSW36 with a 3-year warranty. Air volume is probably the most important criteria. There is no point buying a blower that doesn't blow hard enough! Cordless leaf blowers are available with air volumes from under 90CFM (cubic feet per minute) to almost 500CFM; more is better. Air speed is also important - though it is easier for the manufacturer to play games with this feature (if they supply a small nozzle with the blower & rate the air speed with this nozzle attached, the air speed through the small nozzle will be high, but the blower will not be able to move much air at this speed). A cordless garden tool is not very useful if its battery life doesn't allow you to get the entire task done on one charge. Charging time is also important: it can vary between 30 minutes to over 2 hours, which could have a big impact on the total time to complete the task. As you will be creating dust, you should always wear a filter mask. Safety glasses will protect your eyes from flying debris. Although cordless blowers are quieter than gasoline models, you should still wear hearing protection when using power tools. Don't let children use the blower, or be within 50 feet when you are using it. For more information, check your blower's instruction manual. Very little maintenance is required. Generally you'll just need to remove any debris from the outside of the blower with a stiff brush. Don't use solvents or water to clean these devices - some solvents can attack the plastic housing, and usually these leaf blowers are not protected against moisture. You should occasionally check the outside of your blower for any cracks - there was a recall of some corded electric leaf blowers in 2016, due to cracks in the housing potentially allowing the user's fingers to come into contact with moving parts, so it's worth keeping an eye on. Be sure to read the user manual for any additional tips specific to your blower. There were no recalls listed for any of the leaf blowers mentioned here at the time of writing (October 2017). However, it's always a good idea to check the latest information at the Consumer Product Safety Commission website before buying any large, expensive or potentially dangerous product. Do you own any of the leaf blowers mentioned here? Did you choose a different one? Let us know in the comments!